This healthy chocolate frosting recipe has a deep chocolately fudge flavor. It’s low in sugar and fat, and is super thick and rich. This recipe is vegan, and is easily made a paleo chocolate frosting by subbing honey for the date syrup. Awhile back, I made a healthy chocolate cake for a friend. When it came time to decorate it, I pulled out a bag of powdered sugar I had begrudgingly bought for the occasion. I wanted the cake to look nice, and my previous attempts at a low sugar frosting always turned out too thin to pipe or use in a layer cake. Thinking back to the gooey sweet baked sweet potatoes my grandma makes for Thanksgiving, I realized they would make a perfect frosting base. They are already silky smooth and creamy, and also pretty sweet, meaning less sugar would be needed. And instead of turning out a frosting with no nutritional value, this one packs fiber, vitamin A, and lots of other nutrients as well. The result blew my mind! It’s such a delicious alternative to a traditional buttercream frosting. This recipe was used on my Chocolate Quinoa Cake, and when I offered it to a friend who is used to traditionally sweet desserts, I told her the cake and frosting were healthy and asked her to be honest with what she though. She said, “it tastes like chocolate cake. Good chocolate cake.” Mission accomplished! We make this sweet potato frosting often now. My husband loves the leftovers — he scoops it into his bowl of yogurt and fruit for dessert! I have even served this to my toddler (who of course wouldn’t know the difference) and his friends, and kids love the stuff! To achieve the best textured and flavored sweet potato frosting, be sure to roast sweet potatoes well. I bake mine at 425 degrees F for 1 – 1 1/2 hours. You’ll want to see the skin sinking in and the potato becoming more concentrated inside. If you use sweet potatoes that haven’t been properly roasted, the frosting will turn out more fibrous and will have a sweet potato flavor. Quick Tip: When I’m in a hurry, I microwave the sweet potato for 3-4 minutes, and then bake it for 30-40 minutes. 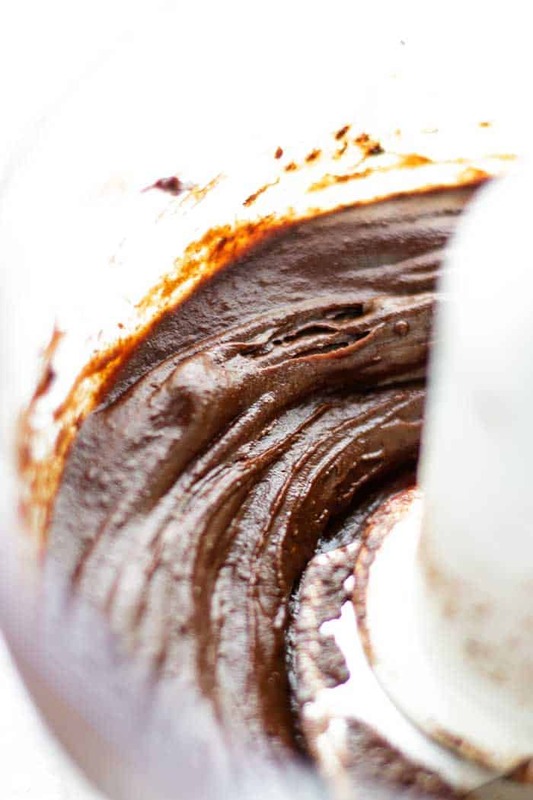 Watch this Healthy Chocolate Frosting Being Made! This healthy chocolate frosting recipe works well in many diets. Make it Vegan: This healthy frosting recipe is vegan as written. 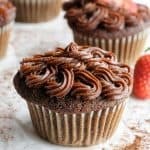 Make it Paleo: This is the perfect frosting recipe if you follow a paleo diet, or if you just like to choose foods with a higher nutritional content. 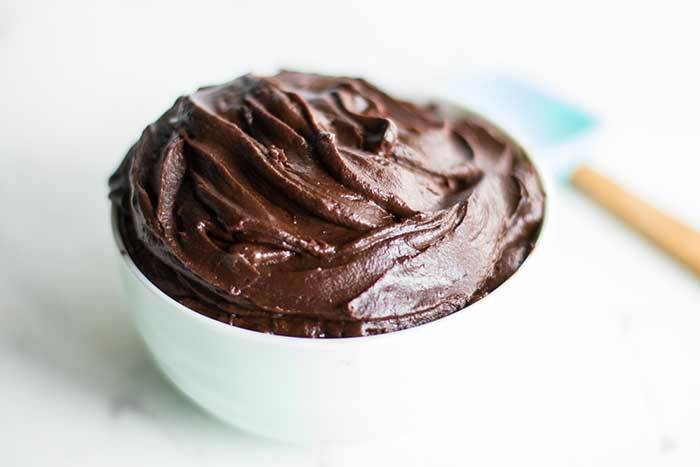 I have made this healthy chocolate frosting recipe using soaked dates, and it tastes great — it doesn’t look quite as smooth, and if you eat it off the spoon, it’s more fibrous than making it with date syrup or honey. On a cupcake, you really can’t tell the difference though. Save time: I like to throw my sweet potatoes in the microwave for 4 minutes before baking them. I have never tried making them 100% in the microwave, because I like how creamy they get in the oven. Make it Ahead: This frosting holds well in the refrigerator for up to a week. If making it with coconut oil, it will need to warm up to room temperature and be stirred well before using it to frost cupcakes. I’ve also made this with grapeseed oil, and the texture stays soft, so there isn’t a need to let it warm up prior to using it. This sweet potato frosting blew my expectations out of the water! If made with the right proportions, no one will detect the potato! If yours turns out a tad "potatoey" (mine has on ocassion), simply add 1 more tablespoon each of cocoa powder, coconut oil, and date syrup. This frosting is easily made vegan or paleo. Be sure your sweet potatoes are fully roasted and very soft. The skin should easily press in or be sagging around your potato. If your potatoes aren't roasted very soft, your frosting will not turn out as smooth and will have more of a sweet potato flavor. Add the roasted sweet potato and cocoa powder into a food processor. Process to combine (it will ball up, and that's okay). Add the date syrup (or honey), coconut oil (or grapeseed oil), vanilla and sea salt. Process again for 1-2 minutes, until the mixture is very smooth and glossy. 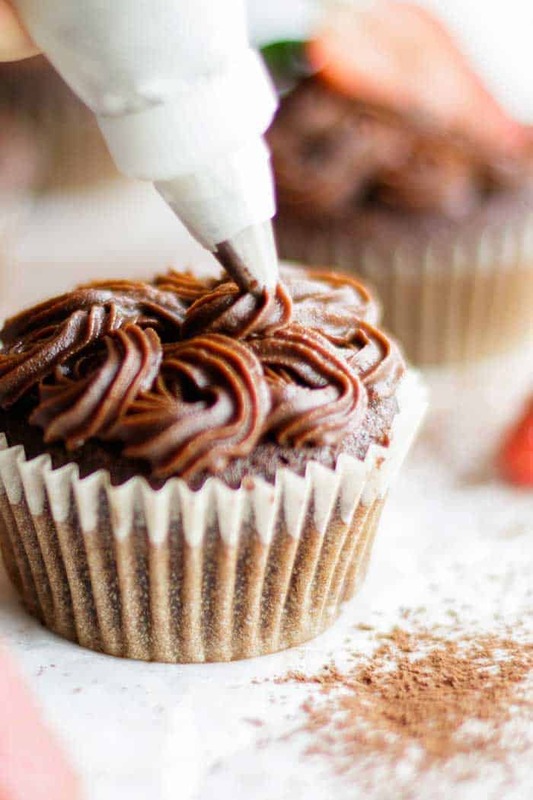 If using coconut oil, it's best to pipe or spread the frosting while it's still room temperature. If using grapeseed oil, the frosting stays soft and spreadable even after being refrigerated. * Honey and date syrup yield similar results. I prefer date syrup because there is no honey flavor in the frosting. I have also tested this recipe using whole dates. If using dates, soak them in hot water first, and then add when you would add the liquid sweetener. It will take longer to process, but the result should still be a creamy and spreadable frosting. This option yields a frosting that tastes a bit fibrous, but is still delicious on baked goods. **I have made this both with coconut oil and grapeseed oil. I love the coconut flavor. If choosing coconut oil, the frosting will become slightly hard (more like a firm fudge) when refrigerated. If using grapeseed oil, the consistency will be the same at room temperature, and it will stay soft after being refrigerated. The grapeseed oil also has no flavor, if you don't like coconut or prefer not to have that flavor in your frosting. 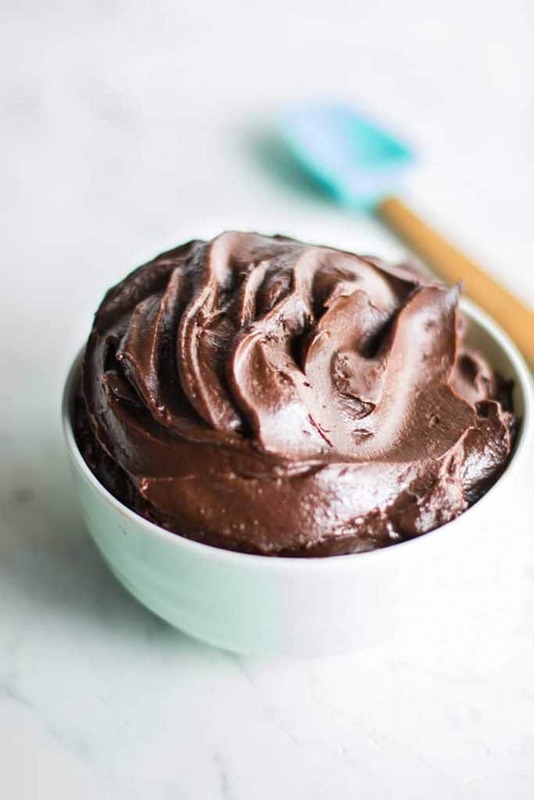 This Healthy Chocolate Frosting Recipe post contains affiliate links, which means that if you click on one of the product links, I’ll receive a small percentage of any purchases made. Love that you made this from sweet potatoes! I've made sweet potato brownies before, but never a chocolate frosting. I'm beyond excited to try this! I'd love to hear how you like it! My husband wants it in the fridge at all times now-- he likes to add it to his yogurt and fruit at night! I actually think the birthday cake you made looks great! I would totally eat that. ;) And yay for healthy frosting! This is such an ingenious idea and it sounds delicious! Coconut oil is always a great health hack because it's good for you AND it tastes amazing. Can't wait to try this on my own cakes! What a great idea! I feel like this is the kind of frosting you can just eat with a spoon and not feel completely guilty about. Sounds delicious too! Thanks for sharing! It is Luci! One of those tastes-amazingly-indulgent, but will not give you a sugar crash treats :) And there was a lot of spoon licking going on in this house. Ooo I love alternative baking ingredients and this looks really interesting! I can imagine that on a gluten free chocolate cake easily. Such a clever idea to use sweet potatoes! I can't claim using sweet potatoes was my own idea-- I've seen it before, but I couldn't find the recipe I had seen before! It works so well I will definitely be making this over and over again. Chocolate frosting + healthy? Awesome! I love the addition of coconut oil. Lately I'm adding it everywhere. Thanks for the recipe! Ooh never knew you could make a frosting with sweet potatoes! This is awesome! Wow I can't believe this is made with sweet potato!! It looks so rich and delicious! I will definitely be trying this one!! What a terrific recipe and idea! I can't wait to try this recipe. This looks awesome. Can’t wait to try it. My birthday is coming up, might have to make myself your chocolate quinoa cake and put this on it. A guilty free Birthday. Hi Michelle, I don't have date syrup so I'm planning to use whole dates. You mentioned that I should soak the dates in hot water. Does it become liquid after that or should I be blending the dates with water for the liquid consistency?Thanks so much! Hi Ying! Yes, this recipe works well with dates also. Just pit the dates, and then pour boiling water over them and allow them to soak for a couple of minutes until they are very soft. Then they will process very smooth for you. I also sometimes make date paste to make recipes like this easier, and if you have a Vitamix, you can make it super smooth. For date paste, use 16 ounces of dates with 1 cup of boiling water, and then process it until it's super smooth and glossy (this takes about 4-5 minutes in my food processor, or 1-2 minutes in my Vitamix). You'll love this fun frosting! Thank you for letting me know Rachel! I prefer date or fruit sweetened treats in our house -- I have an eBook I have been writing this year that will be released soon with 30 new date or fruit sweetened recipes -- be sure to check back! wow thats great cant wait! your date bar is definitely the favourite in our house! it just dissapears out of the freezer way too quick! I hear you on the date bars! They go fast in our house too and I feel like I am constantly making them! I've got two hungry boys who go crazy for them. I've tried it tonight and it was absolutely delicious. The texture was perfect. I used maple sirup as sweetener instead or dates sirup or soaked dates and it worked fantastic. Definitely going to made this again. I love this recipe and I am so glad you do too! My husband eats plain yogurt and fruit for dessert, and now he always asks me to make this so he can add a scoop of chocolate to his bowl! Thanks for taking the time to tell me you enjoyed this, Floriane! Love this frosting recipe! I will be making this one over and over again - seriously delicious! Thank you so much for letting me know Shannon! I love getting creative and making toppings like this with healthier ingredients :) I have a White Chocolate Buttercream you should check out also!